A game based in the midst of the conflict in the Palestinian territories is set to be the latest release in the trend of politically-conscious gaming. Global Conflict: Palestine centres on the activities of a young journalist. 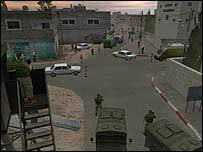 The player must navigate between different Palestinian and Israeli sources to get to the truth of a story. "You can take a pro-Palestinian angle, a balanced angle, or a pro-Israeli angle," said Simon Egenfeldt-Nielsen, of Serious Games Interactive. Mr Egenfeldt-Nielsen told the BBC's Culture Shock programme: "The game is much more about the personal experience; the emotional experience." 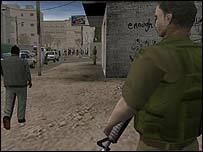 The player walks around a city resembling Jerusalem and its surrounding areas talking to people. As the conflict intensifies, however, the situation becomes increasingly complex and exposes some of the reasons for the ongoing violence. Global Conflict: Palestine, which is released early next year, follows music channel MTV's internet-based Darfur Is Dying, which went online earlier this year and had 700,000 players in its first month. 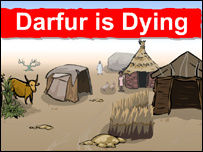 Later, tens of thousands of players sent e-mail messages to politicians to urge action over Darfur. Game designers believe that gaming is one of the most effective ways of teaching people about complex situations - and yet keeping them engaging. They hope the game will not only reach mature players seeking intellectual stimulation, but also the school market. "The Palestine topic fits very well with what you need for making a game," said Mr Nielsen. "It has conflict, different perspectives - people are interested in it. "That was the initial starting point, that Palestine would make a good game. I might regret this, but I think that you can do a game about anything - it depends very much on your framing and your approach to it." Sheila Moorcroft, a futures research consultant based in the UK, said she understood that on one level people could feel that making a game out a conflict situation "trivialises" it. But she added that younger people are not engaged with traditional politics, and additionally get their information about the world in new ways. This actually makes games a good platform for exploring the complexity of an issue, she said. "An awful lot of what is in the media today is simplistic - it's headlines, it's soundbites," she said. "People don't actually have a chance to explore the complexities of some of the situations of a conflict. "In the Darfur Is Dying game, you're someone collecting water and you've just got to use your arrows and space bar to hide from the patrols. Suddenly you realise - as happened, because people started phoning up - this is for real, this is serious. "So you can actually begin to enter somebody's reality." Consoles to plug digital divides?